I really hate being predictable, but eggs and Easter just go together – an inescapable fact. Indeed, I believe the egg is a universal symbol of rejuvenation and fertility. As appropriate, and in keeping with the promise of spring (at least here in the Northern Hemisphere), there were a lot of eggs in my kitchen in the past month. It started with fish eggs, otherwise known as roe. Traditional for Greek Lent is taramasalata, a creamy pinkish dip which I made with smoked cod roe (see my post Tarama for more on that). Then, of course, we couldn’t escape Easter eggs. Over the years I’ve collected tin eggs, which are printed with designs taken from the famous jewelled Fabergé eggs. I fill them with pastel sugar-coated mini chocolate eggs – eggs within eggs. 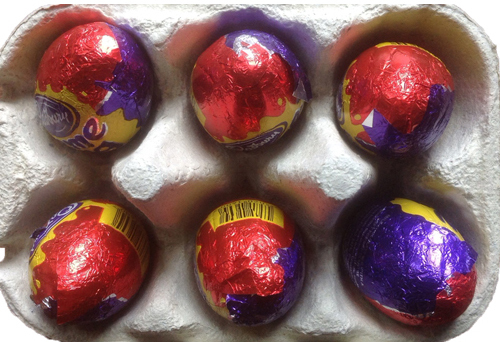 I think there would be a revolt in my house if I didn’t buy Cadbury chocolate creme eggs this time of year. I leave these “treats” with their sticky gooey white and yolk-yellow insides to others. Like Marmite, one has a love or hate relationship with creme eggs. There is also no escaping them in the supermarket! The old novelty egg cups from my mother-in-law also make an appearance this time of year – purely for decoration. I’ve always wondered if people actually use egg cups on a regular basis. Like toast racks, they’re interesting tableware, but how useful are they? I have my doubts – plus I like my eggs scrambled and toast crispy and warm, straight out of the toaster (typical American preference – like cold beer). Then, there was the obligatory baking with eggs – the traditional Greek sweet Easter bread, tsoureki, scented with mastic, machlepi, and orange zest. The braided loaf was enriched with eggs, but I didn’t bother with the decorative red hard boiled eggs that are often nestled in the braid. 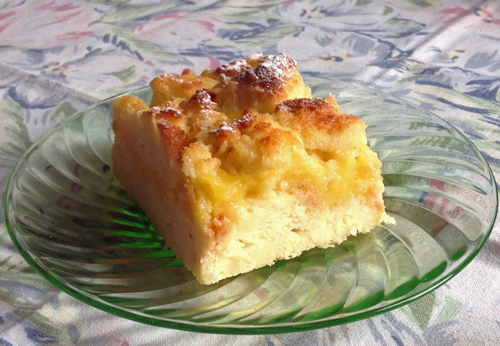 Leftover tsoureki was turned into Bread Pudding with a lemon-orange curd filling – yet even more eggs. And, I’m not the only one egg-centric this past month – a lot of eggs appeared in posts by fellow bloggers. There were a few interesting variations on eggy toast (AKA French toast, pain perdu, Gypsy Toast). Several of you also posted on the traditional Italian torta pasqualina, a chard (or spinach) and hard boiled egg Easter pie. But, the main event was the poached egg. In particular, one poached egg sighting made me chuckle – Cheesy Biscuit’s inventive method of poaching eggs in clingfilm. Brilliant, and yes, it really works! With all these eggs, I thought I was going a bit bonkers when I began seeing egg look-a-likes. Has anyone else noticed that different types of spring flowers resemble eggs? 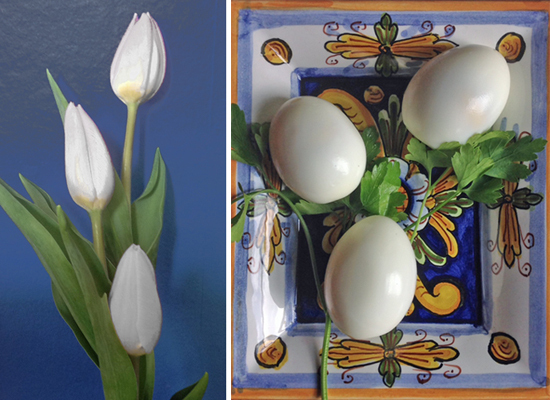 In my kitchen are narcissi, tulips…and eggs – scrambled, fried and boiled. Hopefully, back to sanity next month. You are going bonkers – but I love it. I wonder if those flowers are like the ink blot (Rorschach) test used by psychologists? If so, it definitely indicates I need a holiday! 😉 Had fun writing the post, however. Have to agree – definitely bonkers but rather wonderfully so! I’ll look at eggs in a new light from now on. I use a toast rack but that’s possibly because I hate hot toast and only eat it cold. So who’s bonkers now, I hear you thinking. My husband would say my “American” is showing here – like an embarrassing blemish. Well, we all can’t all like hot (or cold) toast. I like that there is variety in choice – in all things, really. And…I have to admit, some of those toast racks are really cute and I’ve even been tempted to buy one or two. Got many of the tin eggs when we lived in Oxford where there posh delis and gift shops are thick on the ground. And, it’s funny how your perception of everyday things can change simply by looking at it in a new light! I had fun writing the post. Darn, ladyredspecs got to the egg puns before I could….you maybe bonkers but I believe that all the best people are. I have egg cups that are very rarely used and I just picked up some very cool ones at the op shop yesterday…adding them to the collection in the cupboard! Totally in agreement – a certain amount of “bonkerness” is essential to a healthy outlook on life. Egg cups are really cute and there are lots of kitsch ones out there. I never thought to collect them, but maybe I should start, even if the only get a dust off once a year at Easter! Yes, I was going to say that this was an eggscellent post! Thanks! It was entertaining to write. G’day! Your post is EGG-actly what brightens my day! Glad to brighten your day! 😄 I’ll be round soon to visit your kitchen this month. The egg cups are cute and I wondered if I should add to the collection. You always run across odd looking ones in the secondhand and charity shops. And here I thought I was being predictable! 😄 Glad you enjoy the posts. 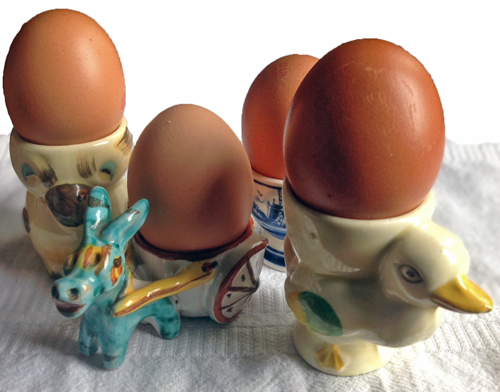 The egg tins are fabulous and the donkey cart egg cup is my favourite! Hi Debi, Great post. It looks like you had a lot of fun writing it. I sure had a lot of fun reading it. All the best. Lots of fun…I don’t know how we would get by without a bit of humour, especially in the kitchen where I seem to spend most of my time. Glad you had fun reading it. Love your beautiful photographs all the way through this post. 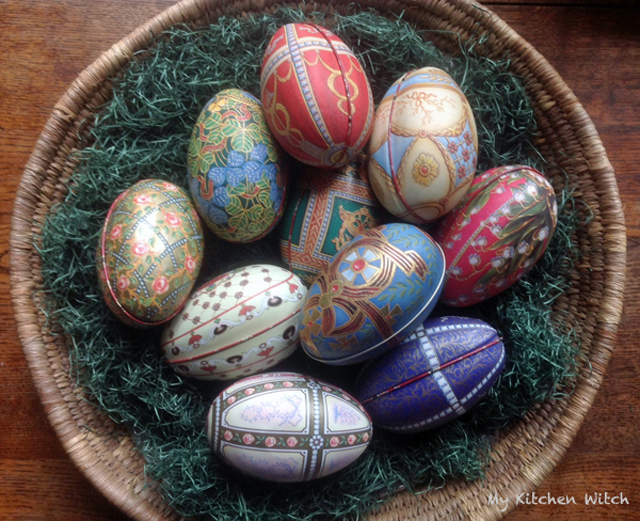 I’m coveting your tin eggs – they’re gorgeous! They are really gorgeous. I got most of them in posh shops originally filled with chocolates when we lived in Oxford, but some secondhand. Recently, I’ve only been able to find inferior ones made of papier-mâchés. I suspect they aren’t made any more. Will keep looking, however. Those tins are gorgeous but the quaint little eggs cups are adorable. I think the same about toast racks – why bother? Who wants cold toast? Same with honey drizzlers. I can see by the flowers tthat Spring is Sprung. Cheers & thanks for the tour! I really love those tin eggs. Funny, I have a honey drizzler I got in Sweden, but never use. I suspect I bought it because it was made of ash wood with a lovely carved head made from horn. It’s pretty, but pretty much useless! Thoroughly enjoyed the egg-y-ness! Thanks for sharing. Despite my efforts after 30 years of trying to fit into the Australian way of life, my Americanness comes through all the time. I love that they accept me as I am! Oh, don’t get me wrong, they do love me the way I am, but there is still a lot of teasing going on. It has been 20 years for me in the UK – and I fit in, but in my own way! your painted egg collection is very impressive. I love an egg in a cup- and the ritualistic slicing of the top, and dunking in skinny fingers of toast. But then, scrambled eggs are so heavenly too. What a great eggy post. 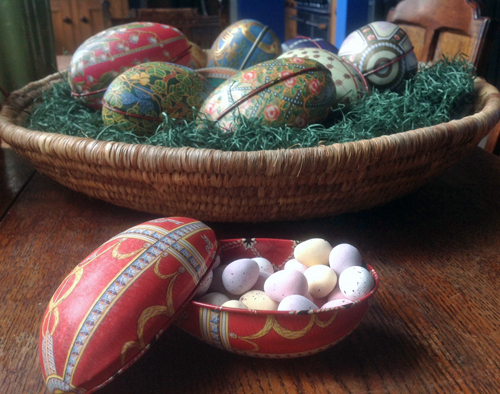 The tin eggs are fab and I wish I could find more – collector’s obsession instincts, I guess. I’m not an eggy “toast soldier” sort of person, so don’t see the need for egg cups. However, they are cute and I wouldn’t dream of getting rid of them. The collector in me may even seek out more kitsch ones to add. This was a great smile inducing post — and a relief, too. My heart started to race when I saw the decorated eggs. I’m all thumbs and knew I’d lose it if a paragraph began, “Now, to make those beautiful Easter eggs …” Instead, you did what was, for me, the kind thing and told us they were bought. Ah, relief! Thanks, too, for sharing that poached egg tick. I am definitely going to give that a try. Oh, I really wish I could make those beautiful decorated eggs, but I am all thumbs with that sort of thing. Sandra (ladyredspecks) pointed out the hazards of cooking with petrochemicals which I’m not sure if that includes saran wrap. I will go back to my usual practice of simmering water in a shallow pan with a dash of vinegar (the latter is supposed to keep the egg whites from going all over the place). But that said, the other method really worked – a had to try at least once since it was quite bizarre! Saran Wrap was “improved” a few years ago and the quality changed. It is supposed to be safer now. I probably should do some googling to see how much safer. Then again, do I really need to know just how bad it was before? What a lovely themed post! I love eggs too, and have no less than 2 dozen in the fridge at any one time and there are only 2 of us in the house! My hubby will only eat his soft boiled eggs out of egg cups with toast soldiers. You know, there are two dozen eggs in my refrigerator as well (with 2 of us and sometimes 3 in the house). We always had scrambled eggs as kids and my husband was allergic to eggs as a child, so no egg cups and toasty soldiers! Somehow, the habit never took. The cups are cute and I dust them off and bring them out for show every Easter. What a fantastic post Debi! I don’t know where to start…those tin eggs – so, so beautiful and I rather like the novelty egg cups. I’m in the hate camp for those awful creme eggs too. 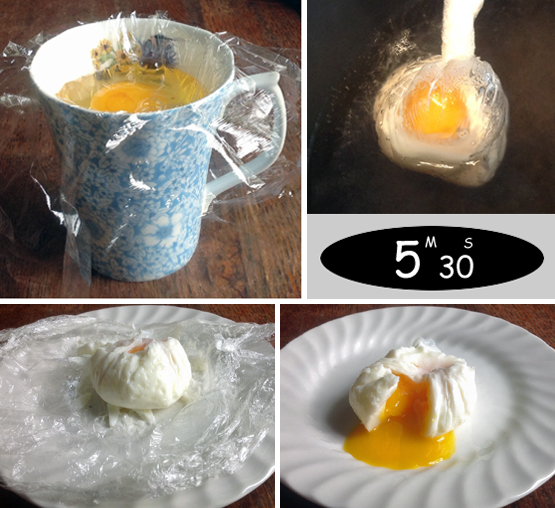 Karinna’s cling film poached eggs are brilliant – I don’t do them any other way now! Cling film has changed a lot – lots of chefs use it for ballotines etc…And your flower/egg photos are just brilliant!! I watched Simon Hopkinson make chopped devilled eggs on toasts topped with a sliver of roe and an asparagus spear – it looked delicious….Loved this post!! I had wondered about cooking with clingfilm…but, you are right, the poaching does work beautifully – a perfectly cooked egg with whites firm and yolk runny. I don’t allow creme eggs in the house except at Easter, so I’m with you there. They don’t really have any taste to them at all except a strong shock of gooey sugar! Love my tin eggs and I wish I could find more. They made them about 10 years ago, filled with chocolates and sold in fancy shops at Easter. After that, I was lucky to pick some up secondhand, but have not seen any recently. They’ve moved on to papier-mâché. Chopped devilled eggs, roe and asparagus on toast sounds just about right! Yum! Loved your egg and never thought about flowers looking like them until your photos. Very clever. I had eggs on the brain when I was looking the flowers and – wham – it just struck me. I don’t think I will look at narcissi or white tulips in the same way again! The egg-flower thing just came to me. I think it might have been pre-1st coffee of the day, in a kind of dazed state, looking at a bunch of narcissi. I use mastic in a number of Greek sweets and breads. It is an acquired taste and I didn’t used to like it, but it grew on me. It pairs really well with machlepi (from a certain type of cherry kernel), particularly in breads. I had wondered about the clingfilm egg trick as it certainly would work well when you have many, many to do at once. and, you are right, the best thing was the egg whites staying put! I’m in the same camp as you with creme eggs. My family is only allowed them once a year and then on the condition that I don’t have to watch them eat them! I was becoming despondent about trying to find fish eggs without preservatives and other rubbish, until I saw your cod roe. I went searching and found some so thank you. I love those egg tins too. 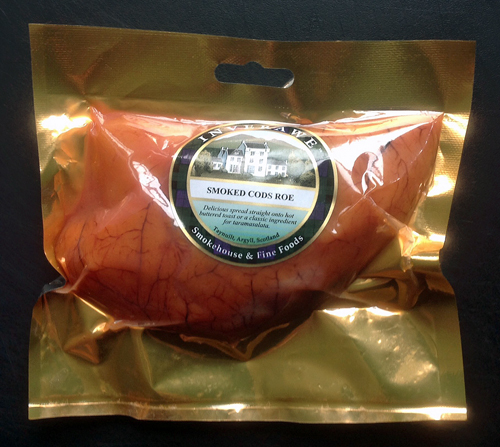 So glad you were able to find cod roe. It’s really good, especially whipped up as a creamy dip, like taramasalata. I love those tin eggs, too! Debi, your imaginative, creative IMK post was egg-xactly what I needed to read 🙂 — inspiring and fun! I loved your Faberge egg reproductions, the poached egg in cling film (never heard of that — will try it!) 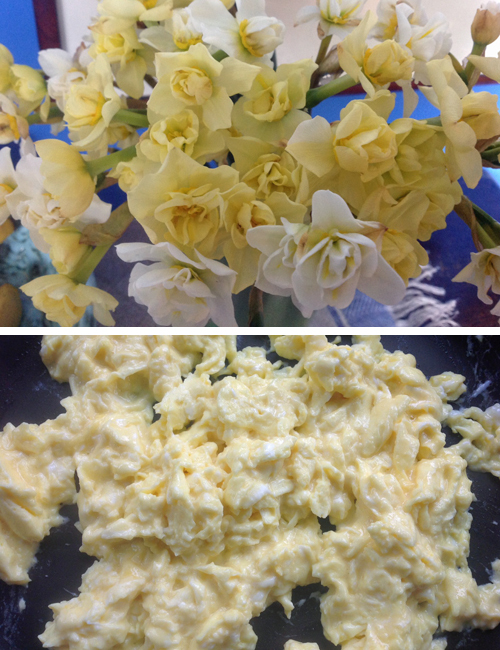 and your flower & egg comparisons. Those were stunning and a delight! I’ve always liked the whimsy of the artist, Giuseppe Arcimboldo. His portraits made from composites of fruit, veg, flowers, fish etc. are perhaps why I see flowers in an odd way. I love my tin Fabergé eggs and I am so glad I got them when I did as I cannot find them anymore. The egg in clingfilm got some mixed comments – pro and con – but I can tell you that it really, really worked.